As we look ahead to the new year upon us, our hearts are full of gratitude. 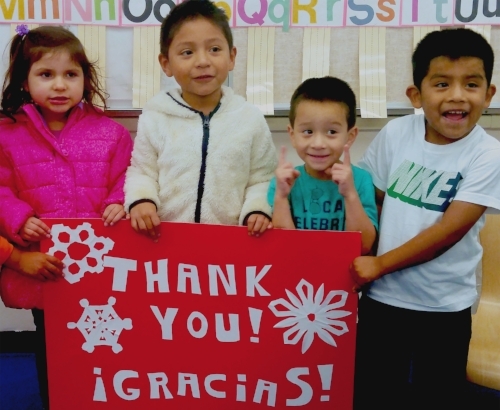 Because of you, Latino preschoolers are getting a strong start to their education while their moms achieve their dreams of going back to school. Latino families in our community are thriving. Thanks to donors like you, we are not only empowering women, we are also helping Latino families grow and transform. With your support, we are building a strong and inclusive community. This year, donors like you surpassed our Give!Guide goal by donating over $30,000 to Adelante Mujeres! We also had help from Por Qué No Taqueria, who rewarded Give!Guide donors with free tacos and matched donations up to $5,000! Thank you Por Qué No! Even more of you donated through the mail and our website. Your kindness will ensure that Latino mothers and children can learn and grow together. And your generosity will help us build a new permanent home for our staff and participants. As we gratefully reflect, in awe of your compassion, we look to the year ahead with confidence, hope, and ambition.